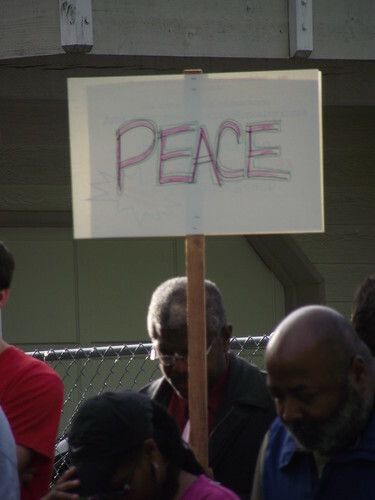 I kept watching for this moment to take a picture of the Peace sign that had been marking the progress of the prayer walk through Rainier Beach, sometimes leading from the front, other times lingering further back. Here, the sign stands in respect, bathed in the light of a setting sun, anchored in the silence of the group assembled at the curbside memorial, and literally announcing the prayers of the man holding it upright. Here we stand, no more running and hiding; this is our stake in the ground, our covenant with generations passed, present, and yet to come. How many does it take? How old do you have to be? What does it cost? How long does it take? Sometimes you just have to choose, trust in the journey, and rejoice in the colleagues who travel with you. We’ll learn together along the way. This article is cross-posted from a Photo Voice project answering the question, “What assets does the community bring to education and learning?” See the photos and stories of the youth, as individuals and teams, on the full site, SE Seattle FreedomNet.